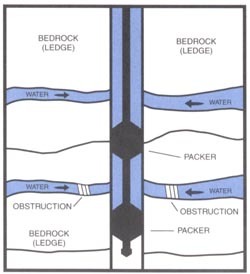 Hydrofracturing is a process by which water is injected into a low-yielding water well at high pressure and volume, opening up and cleaning out the existing fractures found in the rock. 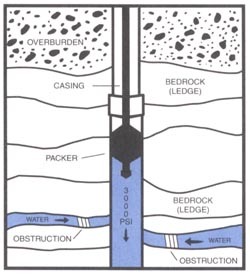 This process is designed for hard rock wells (i.e., if the well will stay open without the need of being cased after drilling, it is a candidate for hydrofracturing). According to Kyle Equipment, the patented process owner of the Hydro-Frac® process, the success rate for this process has a national average of 95% success, making it the most effective well-development tool available. Be sure to scroll down for a detailed explanation of how this process works. 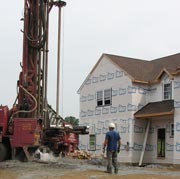 Hydro-Frac operation at new construction in Franklin Township. There are two ways to perform this patented process, which are 1) the single packer set, and 2) the straddle or "Zone" setup. The following is a brief description of both. The single packer set is the most common method used. It is designed to be used in circumstances where a minimal improvement is needed. 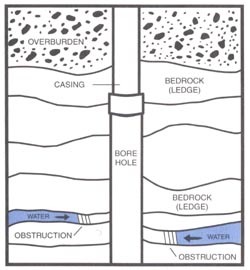 After a well has been drilled, silt and deposits may start to build up in the water-producing fractures, causing a decrease in overall well yield. 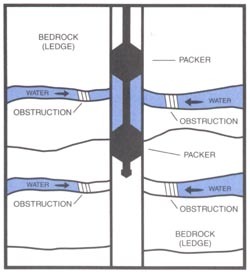 A packer is lowered down the well to pre-determined depth (usually 20' below the casing or a minimum of 60' whichever is deeper), and water is injected into the well at a high rate ( volume and pressure). This will remove the obstruction and open up the water-producing fractures. 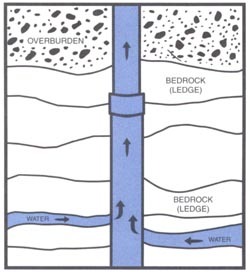 Now that the obstructions have been forced out of the water-producing fractures, more water is able to flow into the well, increasing the overall yield of the well. 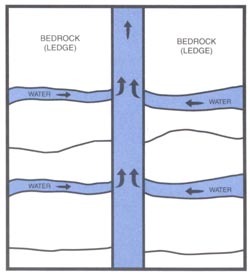 When maximum yield is needed, "Zone" or straddle fracking is utilized. Two packers are lowered down the well, isolating a specific "zone" to be hydrofractured. Once that zone has been freed of its obstructions, the process is repeated at even intervals until the entire well has been hydrofractured. By concentrating the injection where it is most needed, zone-fracturing insures optimum yield. 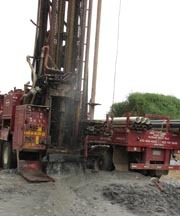 Hydro-Frac® is a registered trademark of Kyle Equipment Company, Inc.